I'm not gonna flood your Google Reader feed with posts, so here's the thing I shall go back and edit. 12:58 p.m. Back from church with lunch canceled, I have made myself three more tacos. 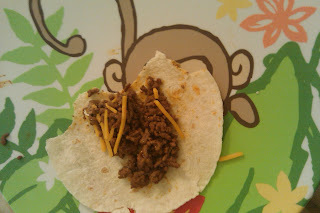 Now, with tacos, I like to use the Old El Paso taco kit for soft tacos, get the highest quality beef I can (let's not be stingy with that extra dollar, people), and buy Kraft Shredded Sharp Cheddar, and lastly, Cholula hot sauce. Why? Because my mom used those brands (excepting the latter, which I picked up on taco journeys with friends) and damnit, I like them. Three tacos down for the day, and when the Italian place around the corner from me opens, I'm buying some Mexican Coke. FIESTA CON LIBROS. As for books..er...I read part of Middlesex on the bus, and now I shall continue that fantastic journey. 3:54 p.m. Nearing the end of Middlesex which is, of course, awesome. Also getting laundry done and baking potatoes for tomorrow, so BAM. ProDUCTIVE. The store by me opens in six minutes, at which point I will get my Coke Mexicano or whatever you want to call it. I've been reading in my room and out back of my building. Basically, readathons are awesome, although this does stymie my desire to marathon Buffy today. Alas! In everyone's life, a little rain must fall. 4:22 p.m. Middlesex: "I worked for the college radio station. I used to get all kinds of free records. And if I liked a girl, I used to dedicate songs to her." He gave me a sample of his style, crooning low: "This one goes out to Jennifer, queen of Anthro 101. I'd love to study your culture, baby." 4:39 p.m. MEXICOKE ES MUY DELICIOSO, SI SI. Also, Elton John's recording of Chapel of Love is currently my favorite thing of ever. READATHON! 7:07 p.m. Five pages from the end of Middlesex. Taco Time shall resume soon. I have had four today. Pathetic. 8:28 p.m. Too much Cholula is a terrible thing. Just enough Cholula is delicious. 8:40 p.m. Eleven tacos and I am out of taco meat. Oh, and I finished Middlesex and am onto the ever-cheerful Triangle Fire by Leon Stein. 9:24 p.m. Taking extended break to watch part of The Birdcage and listen to Shrek the Musical. You heard me. 11:18 p.m. Done, with 22 pages left of The Triangle Fire. I consider this a semi-successful readathon personally. 1. How many books and/or pages were you able to read? Er...probably 200 to 250? I actually have no idea. Ah. This would also be difficult to answer as I have internet-wrought ADD and cannot sit still for long periods (unless it's in front of a computer). So there was a lot of moving around of reading locations and breaks to listen to music/watch parts of campy '90s movies/update this blog. 3. Do you have any likes/dislikes about the 12-hour readathon, compared to a 24-hour readathon? Yes! I am very much a fan of it not being as grueling a process, as the 24-hour one rather intimidates me. But of course, there seems to be a sense of camaraderie that is akin to going through a war together with the 24-hour one. This was easier to fit into my day, and I am a fan of mini challenges. 4. Favorite and least favorite books that you read today? Well. One was about a hermaphrodite and one was about over 100 women who died in a factory fire in 1911, so neither's a huge upper. But Middlesex is one of my favorite books of the year, so let's go with that. 5. Do you have any suggestions for things you'd like me to do differently if I host another mini-readathon? Well, that just seems means after all the trouble gone to. I guess encouraging people to temporarily turn off the 'person verification' words one has to type in to comment? As that kind of discouraged me from commenting more in people's blogs.